One of the hard things about being on a grain-free diet is watching the family eat pancakes every Saturday morning. I love pancakes and every now and then I sneak one because they are so hard to resist. I used to make myself some grain-free paleo pancakes with egg and almond meal … but they really are not my favourite. I find them quite dry and I have to wash them down with a cup of tea. This morning however, I made myself some banana pancakes and I can’t believe I’ve forgotten about them for so long! I used to make them for the kids for afternoon tea. 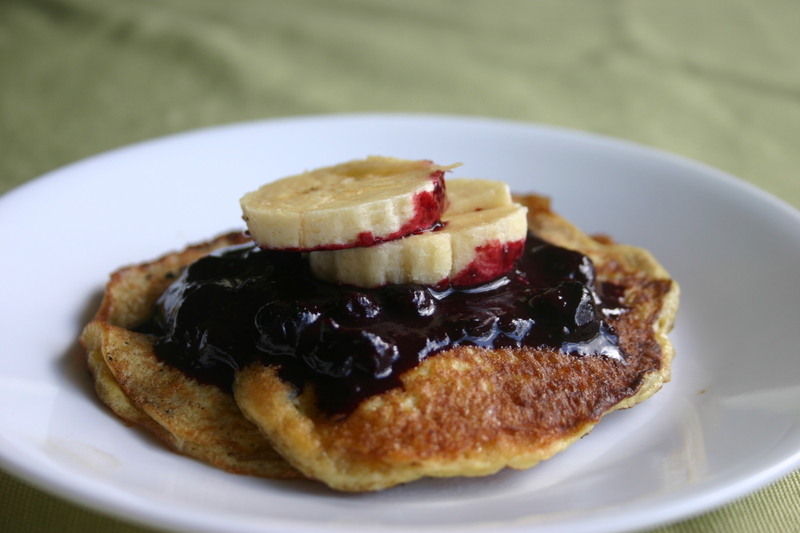 It just didn’t occur to me that I could eat them for breakfast … and actually I am not really that fond of bananas, especially cooked bananas, but I cooked mine in coconut oil and drowned them in a home made blueberry sauce … and they were delicious. Bananas are so cheap at the moment … at 99c per kilo I am buying up a couple of kilos at a time and freezing them for cooking with later. The ones I used today went soft before I had a chance to peel and freeze them but they were perfect for breakfast in these pancakes and enjoyed by 2 out of 3 children – the other one, like me, has never really developed a bond with bananas and was turned off when I mentioned what was in them. If I hadn’t said anything I’ll bet he would never have noticed. As for me, I am pleased to have rediscovered the joys of pancakes for breakfast! 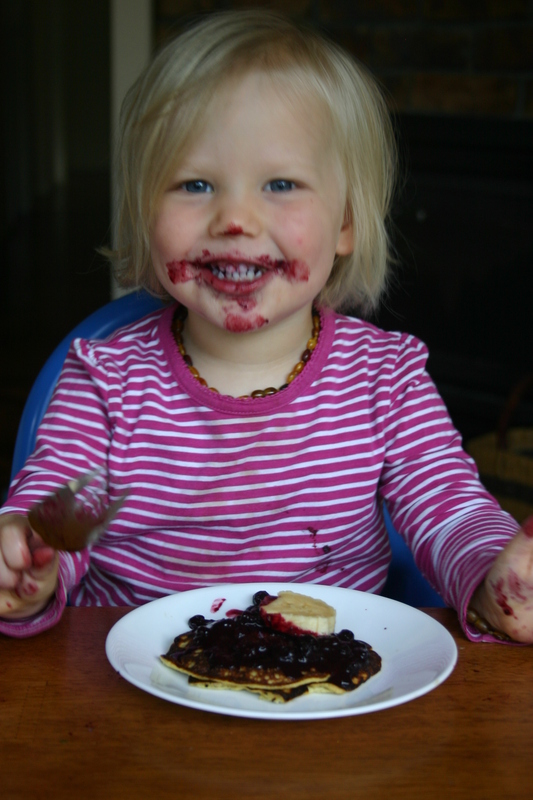 This blog is fast becoming a place where we celebrate toddlers with food on their faces… sorry about that but I never get tired of seeing little ones enjoy their food!! Mash the banana and mix in the egg. If your egg is small you may get firmer pancakes if you add another egg. Heat your pan (I like to use a cast iron skillet) and melt the coconut oil. Cook mixture as you would normal pancakes, turning when you see the edges firm and a few bubbles in the middle. To make the sauce, mix blueberries, honey, butter and cinnamon together in a saucepan and bring to the boil, slightly mashing the blueberries, and cooking until it reaches a consistence you like. Serve pancakes with sauce and fresh fruit. 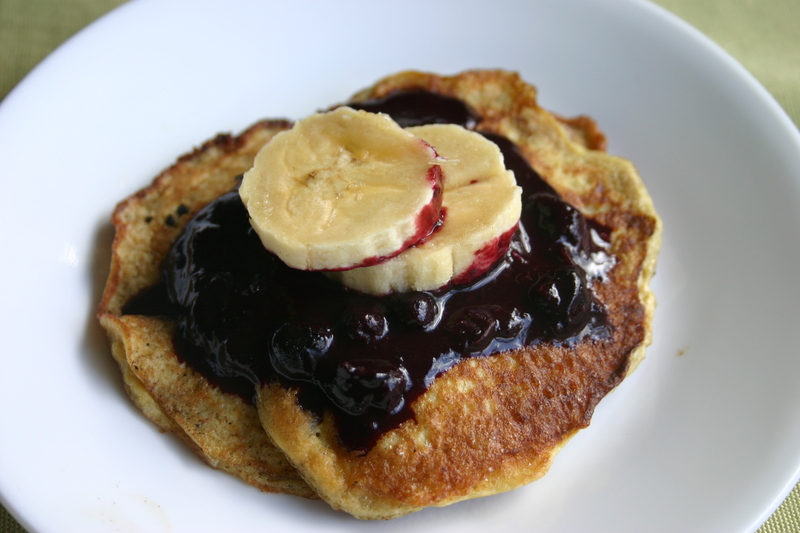 Yum, that’s the same pancake recipe I use and I absolutely love it! I’ll have to try it with your sauce. It sounds fabulous! The photo of your daughter is adorable, by the way!